Location, Location, Location….DON'T walk or drive 2 blocks or more to the beach, all you have to do is just walk a few hundred feet from this Golden Beach Paradise home and you can enjoy the best private beaches and sunsets the Gulf of Mexico has to offer. Your Ocean side retreat gives you all the amenities of home, plus your very own NEW private 30’x15’ HEATED POOL! Enjoy it all under the Lanai and covered patio. The 2 outdoor ceiling fans will ensure you’re evenly surrounded by cool tropical breezes as you lounge by the pool and private back yard for year round outdoor living. Even share your favorite daiquiri concoction thru the kitchen’s convenient pass-thru bar. Friendly, safe and quiet community where time seems to stand still. Your home includes deeded access to the exclusive Golden Beach easement and all it has to offer. The beach is just a short walk down from the house and one of the best places to watch amazing Venice Island Sunsets and prehistoric Shark tooth hunting! WI-FI – Stay connected with the office, check email, surf the internet or watch your favorite Ebay items, because this home has free high speed Internet wireless access for those who choose to bring their laptops. HDTV – Enjoy Movie Night or watch your favorite sports teams with our multiple 42” Hi-Def LED flat panel TV's (family room and master bedroom). Also includes the latest in DVD player technology with Hi-Def up sampling of all your favorite DVD's. Making them even sharper and more vivid on the big screen! 200+ Satellite DirectTV channels to choose from. Our Venice Island beach house is located on the island of Venice, Florida and just 20 minutes South from Sarasota Airport, 1 hour from Tampa International and 45 minutes North from Fort Myers Airport. Or if you prefer, use Venice Island's municipal airport for your private plane or charter. THE BEACH! That’s number 1. Shark Teeth Hunting, Shelling and Turtle Conservation are a must. -- Walk a little farther South from Venice Pier and you’ll find yourself at the famous Venice Dog Beach – Brohard Paw Park. The home comes fully furnished with an eclectic seaside charm that truly compliments the interior layout and surroundings. From the Tommy Bahamas inspired Master Bedroom, to the sophisticated and playful Plantation style guest rooms, this home has a nice balance of style and comfort. To keep life clean and cool, this home has beautiful 18” tile throughout. Ceiling fans in every room to the keep the air moving and constant. Enjoy beautiful outdoor living with a screened in covered Lanai that perfectly canopies the oversized 30’x15’ POOL. Heated naturally by solar, you can swim all year round. Because of its size, this pool is ideal for swimming laps and keeping up with your exercise regime while away from home. When you’re done or get back from the beach, rinse off with the convenient outdoor shower. Under the covered patio are table and chairs to enjoy dining alfresco or to just relax pool side with your favorite book. Around the property are beautiful indigenous flowers and fruit trees ready for your indulging. Includes high speed wireless Internet, air conditioning, Outdoor Shower, Wash Tub, Garage Opener, ceiling fans, Heat Pump heating system, Outdoor Gas Grill, and a washer & dryer. Brand new furnishing throughout, LED HD TV, DVD player, phone, full kitchen including; dishes / utensils / cookware / toaster oven /dishwasher / microwave / coffeemaker, washer & dryer, linens / towels / Beach towels, ceiling fans, and outdoor patio furniture. Note: Beach chairs available for use. House sleeps 6 comfortably. We had a wonderful time. The house was nicely decorated and it had everything we needed for our stay. The house was very nice and close to the beach. We used the pool every day and night. We would absolutely stay here again. The owners are very easy to deal with and were prompt to answering any questions. Just a couple of suggestions about the home are: the twin beds and queen mattresses are very uncomfortable,water in second bathroom shower barely comes out and more runners on the floor so when you come from the pool area you do not track dirt into the home. These issues would not stop me from staying here again. Perfect house for our family. Perfect sized for our family of five. We came for our nieces wedding. So nice to have our own kitchen & pool vs a hotel. The quick walk to the beautiful Golden Beach to catch the sunsets was amazing! The home was welcoming, the owners responsive, informative and kind and our stay was wonderful! 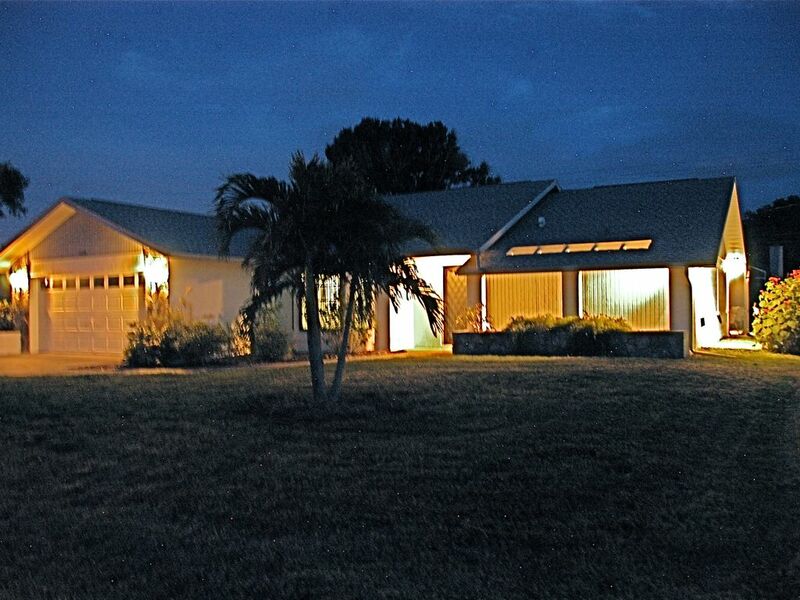 We hope to return in the future and book again at this lovely home in Charming Venice Fl!